The Durotriges occupied what is now Devon and parts of Dorset and Somerset. The Durotriges were one of the Celtic tribes living in Britain prior to the Roman invasion. The tribe lived in modern Dorset, south Wiltshire and south Somerset. After the Roman conquest, their main civitates, or settlement-centred administrative units, were Durnovaria (modern Dorchester, "the probable original capital") and Lindinis (modern Ilchester, "whose former, unknown status was thereby enhanced"). Their territory was bordered to the west by the Dumnonii; and to the east by the Belgae. Durotriges were more a tribal confederation than a tribe.They were one of the groups that issued coinage before the Roman conquest, part of the cultural "periphery", as Barry Cunliffe characterised them, round the "core group" of Britons in the south. These coins were rather simple and had no inscriptions, and thus no names of coin-issuers can be known, let alone evidence about monarchs or rulers. Nevertheless, the Durotriges presented a settled society, based in the farming of lands surrounded and controlled by strong hill forts that were still in use in 43 AD. Maiden Castle is a preserved example of one of these hill forts. The area of the Durotriges is identified in part by coin finds: few Durotrigan coins are found in the "core" area, where they were apparently unacceptable and were reminted. To their north and east were the Belgae, beyond the Avon and its tributary Wylye: "the ancient division is today reflected in the county division between Wiltshire and Somerset." Their main outlet for the trade across the Channel, strong in the first half of the first century BC, when the potter's wheel was introduced, then drying up in the decades before the advent of the Romans, was at Hengistbury Head. Numismatic evidence shows progressive debasing of the coinage, suggesting economic retrenchment accompanying the increased cultural isolation. Analysis of the body of Durotrigan ceramics suggests to Cunliffe that the production was increasingly centralised, at Poole Harbour (Cunliffe 2005:183). Burial of Durotriges was by inhumation, with a last ritual meal provided even under exiguous circumstances, as in the eight burials at Maiden Castle, carried out immediately after the Roman attack. Not surprisingly, the Durotriges resisted Roman invasion in AD 43, and the historian Suetonius records some fights between the tribe and the second legion Augusta, then commanded by Vespasian. 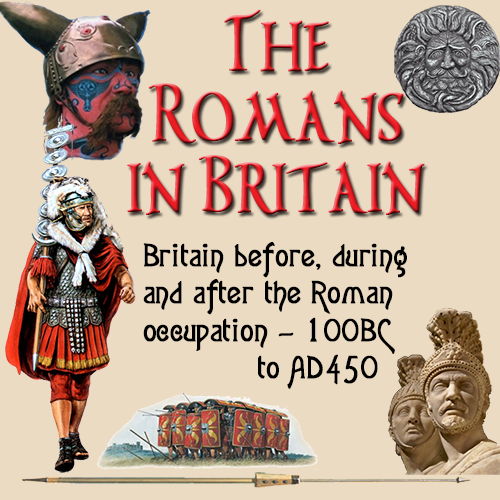 By 70 AD, the tribe was already Romanised and securely included in the Roman province of Britannia. In the tribe’s area, the Romans explored some quarries and supported a local pottery industry. Durnovaria or Dorotrioum - (Dorchester, Dorset) - The civitas capital of the Durotriges. A large walled town. Lindinis - (Ilchester, Somerset) - Was the only other walled town apart from the capital and was possibly the centre of a separate tribal capital of the northern Durotriges. Hengistbury Head - Ancient trading centre of the Durotriges on the south coast of Dorset. Durnovaria Vindocladia - (Badbury, Dorset) - Small settlement to take the inhabitants of the nearby hillfort of Badbury Rings. Woodyates - Small settlement or posting station..
Hamworthy - (Poole, Dorset) - Small port serving the campaign fortress of the Second Legion and the later settlement at Badbury. Radipole - (Weymouth, Dorset) - A small port. Wareham - (Dorset) - A settlement of unknown extent, perhaps the centre of the extensive stone and shale quarries near Kimmeridge and Purbeck. So no records remain of their rulers.